Have you ever had a peice of art overwhelm you? Van Gogh’s Starry Night leaves me with a sense of melancholy. Anything by Jackson Pollack leaves me pensive. Coolidge’s Dogs Playing Poker makes me smile. Wood’s American Gothic makes me feel hearty. Valdes smiling worms make me giggle (that’d be the artwork I bought back in June). 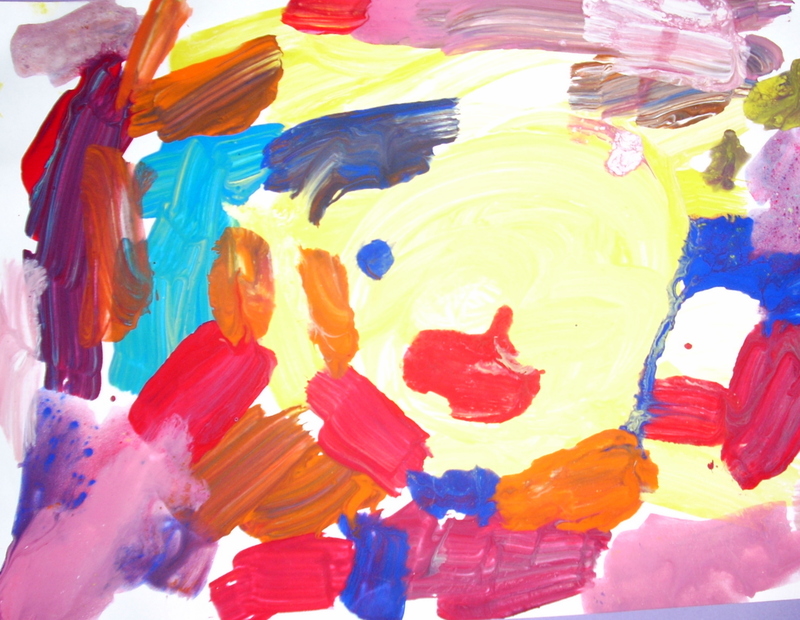 But this painting, by a child in the Spartanburg Foster Care system fills me with absolute joy. At the mall there’s a huge bulletin board called the Community Art Wall. For the better part of the summer, the display on the bulletin board was by the children of Foster Care Spartanburg. Mostly finger paintings. Some of them had various animals, houses, hearts and stars. But it was the above painting, by a child named Marcell (I think – it was hard to read on the back of the picture), that captured my heart. Every time I walked past it, I would stop and stare. Quite frankly, the only thing that kept me from just sneakily taking it was the fact that it was by an orphan. About a month ago, I was shopping with mom and I wanted to show her the picture. I don’t know why I didn’t think of it before, but mom suggested I call Foster Care and just ask about it. So I called…and left a voice mail. About a day later, I got a voice mail. I left another voice mail. I got another voice mail. After the longest game of phone tag in the history of the world, I finally spoke with Cindy at Foster Care Spartanburg, who told me that I was more than welcome to have the picture. I picked it up a couple weeks ago and it’s sitting on my dresser, waiting to be framed. If you, or anyone you know, is interested in adopting or hosting a foster child, please contact Foster Care of Spartanburg, www.fcspartanburg.com.